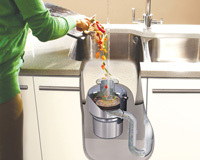 Food waste disposers are devices that are easily fitted under the kitchen sink. They quickly and simply grind kitchen food waste into miniscule particles (less than 2mm) and flush them into the waste water system, to be treated with the rest of the sewage. Driven by electric motor, they are easy and safe to use. Click on the image for a larger view. The grinding mechanism has no knives or blades. Instead, impellers (or lugs) mounted on a spinning plate use centrifugal force to continuously force food waste particles against a stationary grind ring. The grind ring breaks down the food waste into very fine particles - virtually liquefying them. Once they are ground the running water flushes the particles through the grind ring into the wastewater pipe. Food waste disposers are typically rated between 0.4–0.5 kW. Requiring a very short run time, their energy and water use is minimal. DEFRA’s Market Transformation Programme (MTP) estimated that on average food waste disposers run for just over 15 seconds per use and use just 2-3 kWh of electricity a year. At current average electricity prices this represents a cost of approximately 46 pence p.a. A disposer’s average water consumption is only 0.07% of a household’s annual use, or the equivalent of about one extra toilet flush a day. 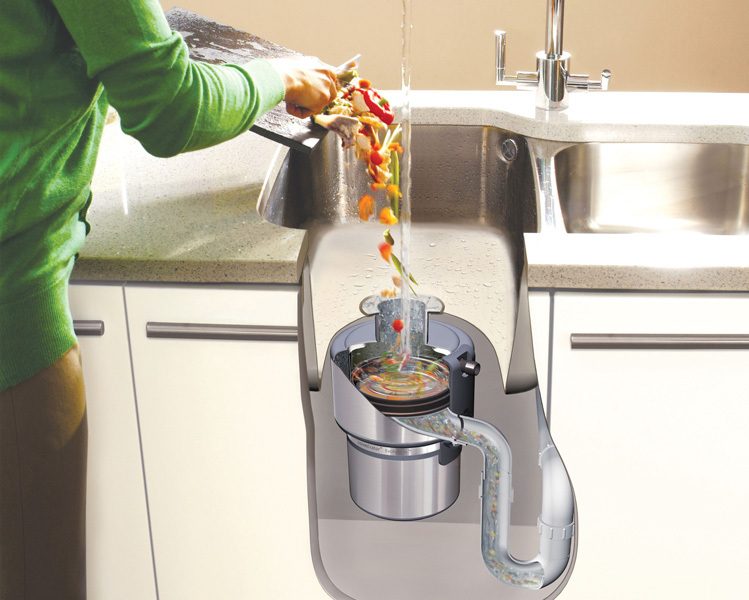 Find out what happens to waste once it goes down the food waste disposer.